At the end of May, Northern hemisphere observers lost visibility of KH-11 Keyhole/CRYSTAL USA 186 (2005-042A) when the midsummer nights became too short. 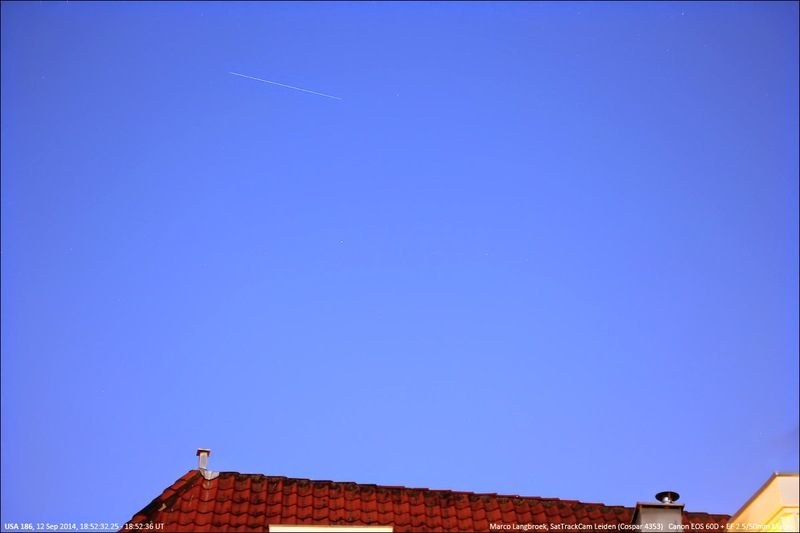 The orbital plane of the satellite was still drifting at that time, a process that started after a manoeuvre in mid-November 2013 (see earlier posts on this blog). The big question was, when that drifting would stop. I expected that when the satellite reached its new intended orbital plane it would manoeuvre into a stable sun-synchronous orbit again. It now has done so, having manoeuvered probably on or near July 1. The orbital plane drift has stopped. Kevin Fetter in Canada made a chance recovery of the satellite, the first post-summer glare-out sighting, on September 8: he was looking for another object and saw a "unid" in Low Earth Orbit pass through his field of view, that Cees Bassa was quick to identify as USA 186, in a new orbit. Over the next nights several other observers tracked it (including me on Thursday and Friday evening) yielding a first version of the new orbit it is in. The satellite has drastically lowered its perigee apogee by almost 500 km, and gently raised its apogee perigee by a few km. It is now in an approximately 265 x 440 km, 96.9 degree inclined orbit. This orbit is sun-synchronous again. This means that the RAAN drift relative to the other satellites in the KH-11 constellation that had been going on since mid-November 2013, has stopped. It has finally settled at a RAAN distance of about 25 degrees from USA 245 (2013-043A), the primary West plane KH-11. 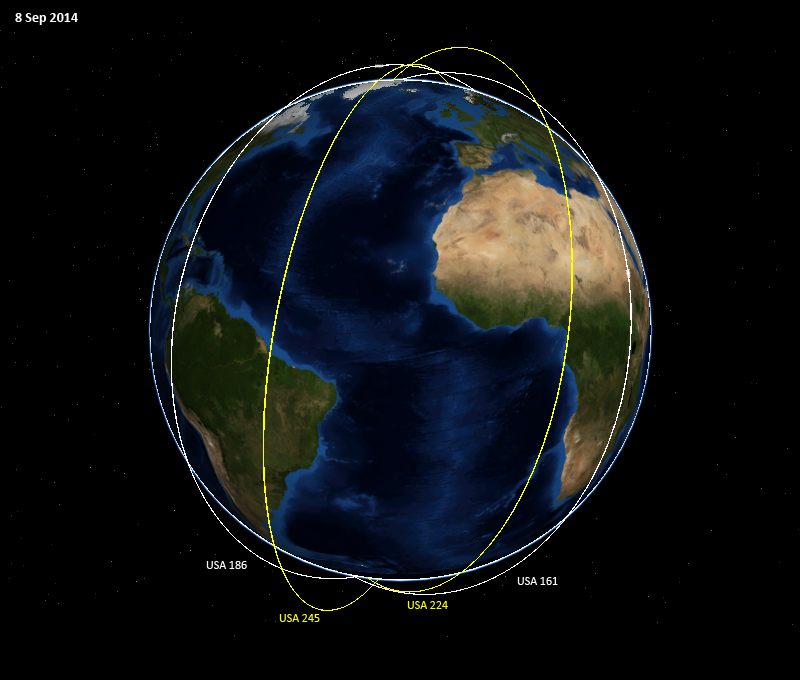 Comparing the new orbit to the old orbit suggests that the manoeuvre into the new orbit happened on or near July 1st. 4) that in that manoeuvre it would drastically lower its apogee from near 1000 km to near 400 km and gently raise its perigee. This all has basically happened. It differed on details with my predictions, but the bigger picture is pretty much as I anticipated. What was somewhat unexpected, is that the satellite had its RAAN drift to a much larger distance with respect to the primary West plane (now occupied by USA 245) than I had anticipated. I expected 10, maybe 20 degrees. It turned out to be almost 25 degrees. The perigee, although indeed raised, is slightly lower than I expected. The massive lowering of the apogee is exactly how I expected it to be however. 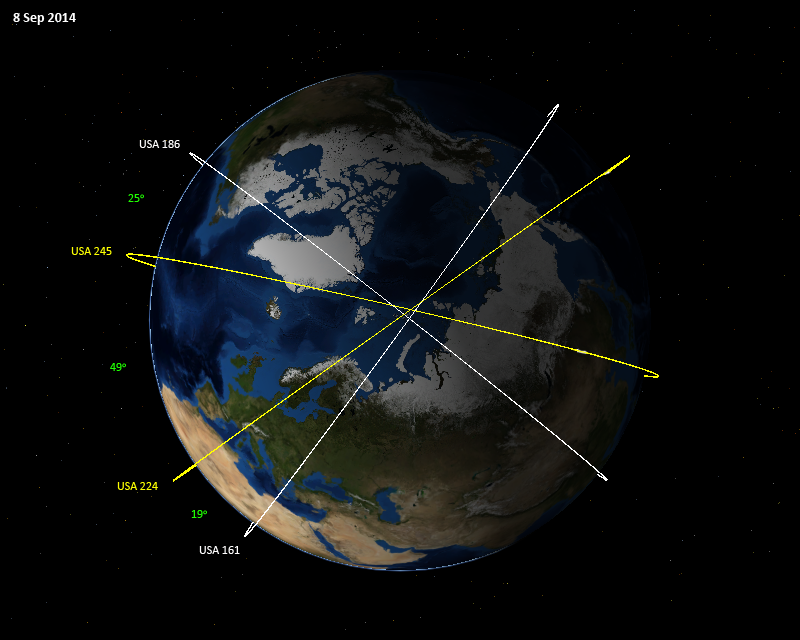 The current orbital plane makes it make passes near 8 am and 8 pm local time. Meanwhile, there are indications that USA 245 (2013-043A) in the primary West plane has manoeuvered. 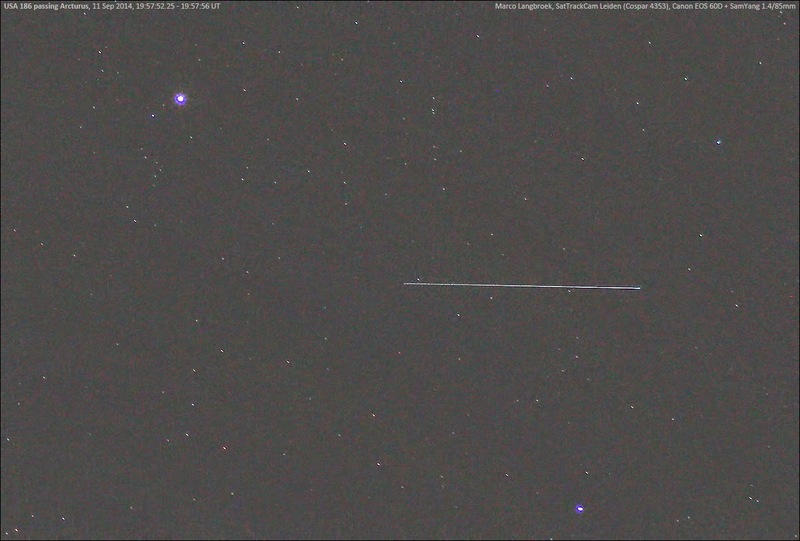 Russell Eberst still observed it in it's last known orbit from Scotland on Sep 7. Then Bjorn Gimmle from Sweden observed an unknown object on Sep 10, that I suspect is USA 245 after a perigee raising orbital manoeuvre conducted between Sep 7 and Sep 10.